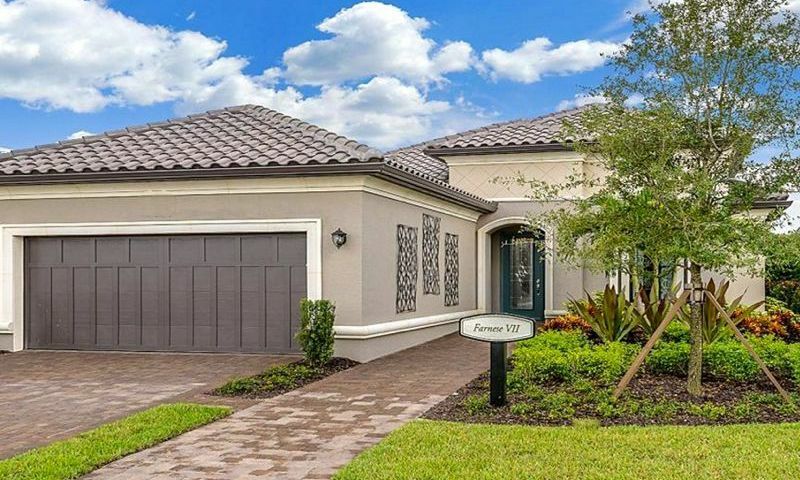 Pebble Pointe at The Brooks is an active lifestyle community located in Estero, Florida. This gated neighborhood is within the master-planned subdivision of The Brooks. Pebble Pointe at The Brooks will feature charming private amenities like a beautiful gazebo, community dog park, scenic lake, and lush landscaping. Pebble Pointe at The Brooks will consist of 90 elegant single-family homes designed by renowned builder Taylor Morrison. Residents will be able to choose from a variety of distinct floor plans that cater to any homebuyer's preferences. This picturesque neighborhood will be conveniently located in Lee County with easy access to many attractions. Although the community will not have a clubhouse, proposed amenities are to include a picturesque gazebo, community dog park, a scenic lake, plenty of open natural space, as well as walking and biking trails. Homeowners of Pebble Pointe at The Brooks will have the opportunity to purchase a membership to access The Commons Club. The Commons Club is a 10,000 square-foot amenity complex within The Brooks master-planned community. The Commons Club features indoor and outdoor amenities that are sure to keep members physically fit and socially active throughout the year. The clubhouse features a state-of-the-art fitness center, aerobics studio, day spa, and Rosie Spoonbill's restaurant. Residents will also be able to take continuing education classes at The Commons Club Enrichment Center. Outdoor amenities are superb as well. The clubhouse has an outdoor pool and spa, a half basketball court, shaded pavilions, boat dock, and private beach. There are a variety of membership options for homeowners to choose from so they can have the social lifestyle that suits them best. Well-known builder Taylor Morrison began construction of Pebble Pointe at The Brooks in 2015. This 38-acre enclave will consist of 90 luxurious single-family homes upon completion. Pebble Pointe at The Brooks is a natural gas community and has no CDD fees. Homebuyers can choose from five unique floor plans that range in size from 1,856 to 3,144 square feet of living space. These single-family homes have two or three bedrooms, two to three-and-a-half bathrooms, and an attached two-car garage. Trevi VII and Carina VII models offer second-floor living spaces but still offer the convenience of first-floor master suites. All homes feature open layouts, dens, gourmet kitchens with granite countertops and maple cabinets, flexible space options, luxurious master suites, paver walkways and driveways, and spacious lanais. Residents of Pebble Pointe at The Brooks will enjoy a social lifestyle and be as active as they want. There will be plenty of activities and events going on at The Commons Club for homeowners who choose to become members. They can join an aerobics or Zumba class, go on a tennis or golf outing, or take an education class to enrich their minds. For those who opt out of The Commons Club membership, homeowners can walk their pet in the dog park. They can enjoy scenic views of the lake at the gazebo while having a cup of coffee. Residents will also be able to take leisurely strolls in their charming neighborhood. Pebble Pointe at The Brooks is located in Estero, Florida. Homeowners will have easy access to many attractions, shopping, and entertainment. Coconut Point Mall and Bonita Community Health Center are located minutes away. Residents can visit Naples, Fort Myers, and Bonita Springs, which are less than 30 miles. The beautiful beaches and entertainment of Sanibel and Captiva Islands are also 30 miles away. When traveling farther is required, Southwest International Airport is only a 20-minute drive away. Pebble Pointe at The Brooks is a great active lifestyle community in a convenient area within Southwest Florida. The Commons Club offers excellent resort-style amenities to members. A membership is optional but required to access these amenities. There are plenty of activities available in Pebble Pointe at The Brooks. Here is a sample of some of the clubs, activities and classes offered here. Homebuyers can choose from five unique floor plans that range in size from 1,856 to 3,144 square feet of living space. These single-family homes have two or three bedrooms, two to three-and-a-half bathrooms, and an attached two-car garage. All homes feature open layouts, dens, gourmet kitchens with granite countertops and maple cabinets, flexible space options, luxurious master suites, paver walkways and driveways, and spacious lanais. 55places.com is not affiliated with the developer(s) or homeowners association of Pebble Pointe at The Brooks. The information you submit is distributed to a 55places.com Partner Agent, who is a licensed real estate agent. The information regarding Pebble Pointe at The Brooks has not been verified or approved by the developer or homeowners association. Please verify all information prior to purchasing. 55places.com is not responsible for any errors regarding the information displayed on this website.